The Mothers Union was formed in 1876 by Mary Sumner whose husband was Rector in Winchester at the time, and later became a Bishop. The organisation spread quickly, as many of the ladies involved, were army officers wives and when they went abroad started branches. The first Mothers Union Branch in Ireland was formed in Raheny in 1887, by the Rector's wife Mrs Annabella Hayes in affiliation with Winchester Diocese. In 1901 the Bishop and Mrs Sumner visited Ireland. The oldest Branch in The United Diocese of Cashel, Ferns & Ossory is Wexford Branch where early records state that a Branch was formed in 1892 with a membership of five. This was prior to setting up a Diocesan organisation in 1904, so the Branch was affiliated to Dublin. The next two Branches which were formed in the United Diocese were Lismore in 1894 and Kilkenny in 1895. 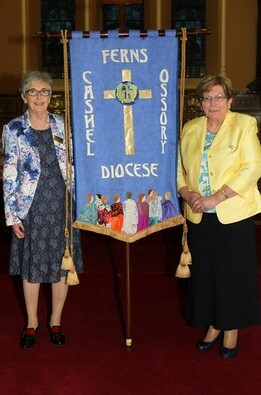 A new Diocesan Banner was designed and made by Frances Bradley when the United Diocese was named Cashel, Ferns, Ossory. The Banner was dedicated at the Festival Service in Enniscorthy in May 2015. The latest Branch was formed only this year, 2017, and it is in Old Leighlin. The General Synod of the Church of Ireland took place in Armagh from 10th - 12th May. There was a large number of Mothers' Union members representing the Diocese at Synod. At the General Meeting in Edinburgh last autumn there was a very poignant display of shoes with captions telling the story of each pair. This was replocated at Synod by Mothers' Union and pictures of the displays can be seen in the slideshow to your left. The Right Revd. Michael Burrows book "Route 66 - Empowering women through Literacy "~ Short reflections from each book of the Bible was launched at Synod by The Very Revd. Maria Jansson, Dean of Waterford Cathedral. COMUN, our Diocesan Magazine, won first prize in the Media Awards for a publication by an Affiliated Organisation. 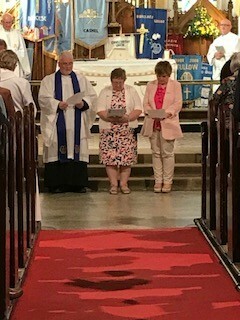 The 2018 Festival Service took place in Christ Church Gorey on Wednesday 16th May. The Service and refreshments afterwards were very kindly hosted by Gorey / Hollyfort Mothers' Union. The special preacher at the Service was the Very Revd. Tom Gordon, Dean of St. Laserian's Cathedral. We were delighted to have the Right Revd. Bishop Michael Burrows, All Ireland President - Phyllis Grothier, Diocesan Press Officer - Margaret Hawkins and our Diocesan President, Revd. Margaret Sykes present at the service. Following the service Phyllis presided over the Diocesan launch of "ROUTE 66 ~ Empowering women through literacy" ( Short reflections from each book of the Bible) by Michael Burrows. Thank you to everyone who put so much though and effort into the service, to Henry Percival for playing the organ, the Fun/Fellowship Choir who led the singing and a particular word of thanks to all who provided the refreshments after the service. The Subscriptions for 2019 are due in the new year. Branch Treasurers should forward the money to the Diocesan Treasurer in January.